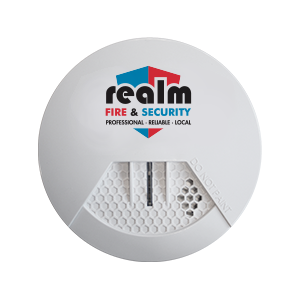 Realm Fire & Security can design and install smoke, heat and gas detection systems for your business or home in Aberdeen and Aberdeenshire. Smoke, heat and gas detection systems provide an early warning to everyone in the building if or when a fire occurs. There are 3 types of detection systems smoke, heat and gas. There are different types of smoke detectors and heat detectors available. Below is the description of the 3 types of detection and the different detectors for each. There are different types of smoke detector: optical/multi-sensor, ionisation and beam detectors. Optical smoke detectors operate on the principal of infra-red light refracting off smoke particles entering the chamber. This makes this type of detector more sensitive to smouldering fires such as modern fabrics or furnishings. Optical detectors are more prone to false alarms from steam or dusty environments (outside bathroom/building works). Beam detectors comprise of a transmitter and receiver. The transmitter emits an infra-red beam from the TX (transmitter) to the RX (receiver), the beam detects obscuration by the smoke. Ionisation detectors operate on the principal of charred smoke passing between two electrodes causing a small current flow. This makes this type of detector more suitable for fast flaming fires such as paper/wood. Ionisation detectors are more prone to false alarms from a burning smell, i.e. outside a kitchen. There are two main types, rate of rise and fixed temperature. Heat detectors will respond to a sudden increase in temperature but will also have a fixed element in case of a slow smouldering fire. Rate of rise detectors are most suitable for areas where a smoke detector is undesirable, i.e. staff room. Heat detectors have a sensing element fixed at a particular temperature, when this is reached, the detectors operate. Fixed temperature is ideal for kitchens or boiler rooms, where a rate of heat rise detector would be unsuitable. Toxic and flammable gases present a serious risk to health and safety. When toxic gases are present the risks of poisoning or asphyxiation increase considerably and when flammable gases and vapours are exposed there is a serious danger of fire and explosions. It is imperative then that an early warning gas detection system is in place and one which ideally has the capacity to respond automatically to reduce further risks. Realm Fire & Security can provide a gas detection solution for all applications, utilising a range of sensing technologies for all target gases.